Welcome to this review of the USCutter MH Vinyl Cutter machine. This review is designed to be a no-nonsense, unbiased look at a good quality vinyl cutter machine you will enjoy using for your small business and personal needs. The machine is relatively easy to use after a few practices runs and comes with a good number of accessories to help get you started. The software for the machine is also included and easy to install. The vinyl machine is intended for beginners but can be a fine choice for veterans as well. If you are on a budget, the USCutter MH Series machines are the biggest band for your buck. Besides being in a good price range, it cuts fairly well too. It’s very popular among those in the crafting and vinyl cutting world, mostly for its great price tag. If your goal is to make custom vinyl signage, vehicle decals, window graphics, t-shirt transfers, or anything in between, this great machine will have you covered. 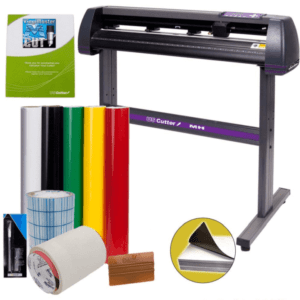 When you’re looking to buy any vinyl cutting machine, it’s good to consider the different packages. If you’re a beginner or someone looking to buy their first machine, a bundle package might be best. The bundle comes with everything you need and rolls of vinyl. If you are more experienced and have the needed tools, then consider the regular package. Lifetime phone support, for free! The VinylMaster Cut Software- $60 Value! Check out the bundle price on Amazon. As you can see, the bundle package is definitely the better option for beginners. You get much more stuff, and it’s great if you’re just starting out. You’ll have lots of vinyl to practice with right away. The great news is that whatever your crafting needs call for, the people at USCutter have made a machine that works. They vary in price according to size but are still a great value and perform like a dream. Buy a stand for the machines is optional. You save a little money, about $20 by not getting it, but we think it makes a great accessory and adds value. This MH cutting machine is designed primarily for vinyl cutting, so the types of material it can cut are more limited. If you are looking to cut more material and are okay with a smaller cutting width, check out the Cricut Maker or KNK Zing Orbit machines. The Silhouette Cameo machine has a 12″ cutting area but can cut up to 10 feet in length. To see all of our die cutting recommendations, see our top picks. 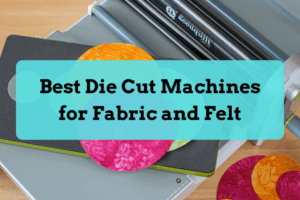 Despite having a really competitive price tag, this machine does a really great job precision-cutting and making your designs come out just as you would like them to. To start, the stand on this machine is just what crafters need if you’re cutting big projects. It stays in place and is nice and steady, even in busy workshops like ours. The stand does not feel cheap or flimsy. There are wheels as well, so you can roll it all around the workspace. You can thank the dual ball bearing media roller system for being what really sold us on this great cutter. It allows your media to be placed on the top of the rollers. You literally do not have to feed it through the roll each and every time. What a great time saver it is! The pen adapter lets you use just about any pen you could ever imagine to help create all of your signs, crafts, and more. You can use any tip size or color you like to get just the perfect design down. What’s really cool about the pen adapter tool is that you can practice test cuts until you become more comfortable using the machine. This is a great way to save material. The spool function here is nice. You can send multiple jobs to the queue to be sorted by color, which is a nice way to save time for some of your more complex tasks. The pinch rollers made the machine a great value. We noticed the three pinch rollers were fully adjustable, so we could use a big variety of materials in there with ease. The rollers can pinch a 3-inch wide piece of vinyl, which means you can use those little pieces of vinyl without having to cut bigger sheets. Our focus was on the 34-inch model. With a max cutting width of about 31 inches and a length of around 8 feet, you can do a whole lot with this great vinyl cutter. If you seek a cutting machine that will deliver simple but effective signage, this is a great machine to choose. 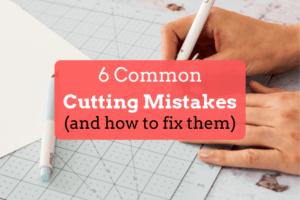 If you are looking for cuts that are more on the intricate or complicated side, or need a cutter that can handle large, complex jobs, this may be somewhat unreliable. Do not fret, however-the cuts are very high quality and the pinch rollers of the plotter allow you do to precision cutting that you can customize freely whenever you care to. This thing works best when you set it to work on smaller jobs, one at a time. The price point is a huge “pro” when we talk about machines like this. Not only is it cheap all by itself, but the bundle is a huge value as far as we are concerned. You get some great vinyl to start and some handy tools like hobby knives and extra blades-who can complain? The three blades that come in the bundle mean you don’t have to send away or run to the craft shop for replacements. You can just keep business flowing and the work moving at a steady pace. Even checking reviews on Amazon shows that many buyers are overall very satisfied with their purchase, giving on average 4 out of 5 stars. Check out the Amazon reviews here. Another “pro” is that the ease of use is definitely there. Everything is so easy to maneuver, and it is rather intuitive for such a low-priced cutter. If you’re new to crafting, or are working with/training a newbie, this is a good way to start them off. Some state that the manual is hard to understand and not helpful, but I did not find any issues with it. The manual is easy to understand and features some helpful content, like quick troubleshooting methods. Plus, because this cutter is so popular, you can find heaps of great YouTube videos that will point you where you need to go. The software that comes with this machine is easy to use-we will go into that a little bit later, though. This machine cannot really sustain its quality cutting performance on some of the larger jobs. Users (and us too) have found that it could be hit or miss when it comes to getting larger or more complex jobs done and over with. We found they started off pretty well, but the machine would sometimes stop in the middle of the job. This results in some frustrations and wasted vinyl material, much to our dismay. The jobs you put into this machine will fare better if you keep them small and simple. If you know you’re going to be doing some bigger jobs, we recommend opting for a bigger investment. A product like this, although enticing thanks to its great price tag, simply won’t hit the target. When it comes to machine memory, it was more lacking. A complicated or intricate job only confuses it, which results in the machine sometimes freezing up and the materials getting wasted. Talk about frustration. Like with all blades, they become dull the more you use them. The good thing about buying the bundle is it comes with 3 extra blades. The blades that have the sharpest points (the 60-degree ones to be exact) will dull the fastest, kind of like how a sharp pencil will wear down quickly with use. When cutting, you always want to be sure to have clean cuts and minimize wasted material. Once the blades become dull, you can easily replace them. You can definitely adjust the blade for the work you are doing. A lower angle, such as a 45 degree one, is great for thinner materials, but a steeper one is good for vertical cutting that goes deeper. Even if you do accidentally wear down your blade faster as a result of learning to use this machine/the art of craft cutting, the bundle does supply you with three extras. Buttons are clearly marked, and the instruction manual gives you a good, clear picture of what to expect with the machine. Reset Button: Stops the cutter and set the origin of the carriage arm to its rightmost position. Offline/Pause Button: Puts the cutter into a pause mode or just takes it offline. Setup Button: Access the setup mode. Test Button: Cuts a small test shape so that the current force and speed settings of your cutter can be tried out. In this manner, you can determine the correct cutting speed and force for whatever materials you are using. It helps cut down on waste. Origin Button: Tests z-axis functionality. V+ and V- Buttons: Adjusts the cutting speed. F+/F- Buttons: Adjusts the cutting force. The USCutter MH-Series works with standard vinyl cutter PNC1000 drivers, which means it can work with a variety of viny cutting software. The standard software that comes with the machine is the basic edition of VinylMaster Cut. You can even create your own designs in other programs like Photoshop, CorelDRAW, and CAD and import them to the software of your choice. According to the manufacturer, Mac is not supported, though many people have had success running it on their Mac computers. VinylMaster Cut is the software that comes with the MH cutter and is designed specifically for making vinyl signage. With VinylMaster Cut, you can produce a wide variety of vinyl pinstriping, lettering, general signage, and all the styles of lettering your mind can dream up. The software comes with a nice pack of fonts, object tools, and curve. They come vectorized and are ready to cut right away. You can also edit images, make shapes from scratch, customize your text and create logos and a lot more with this software. There are also vectorization tools and design image tools, so the sky’s the limit with this software. And if you’re looking to learn, the software comes with 200+ Lessons and Tutorials included at no charge. If you are looking to run the USCutter MH Series on a Mac computer, you’ll need to use Mac compatible software, like Sure Cuts A LOT (SCAL). Sure Cuts A Lot (SCAL) is a popular vinyl and die cutting machine software. You’ll want to choose the right version to make sure it fits your needs. One benefit to SCAL over VinylMaster Cut is that is has a Windows and Mac version. It also comes with free technical support, a huge plus if you need it. In this portion, we will discuss some basic maintenance tasks. For the blades, be sure to replace them after 6 months of use, so that your cuts will be as sharp and clean as can be. Of course, this all depends on how much you use the machine. Be sure to replace the cutting strips periodically. The cutting strip is the protective strip that you find right under the carriage arm that prevents cutting blade damage. Over time it develops small abrasions and cuts. Occasionally, you will also want to clean the blade holders, as they do get debris built up inside. Take out the blade holder cap and clean the debris every now and again. It is best to refer to the product manual, which you can find here. The manual has great info about the warranty-here are some basics. This USCutter MH machine is decent vinyl cutter if you’re into the hobby, or a small business owner specializing in signage manufacturing. It’s got a great price and cuts out simple designs with relative ease. However, if you are attempting to use this for large-scale jobs, go with something a bit more advanced. This is best suited for smaller scale vinyl cuts. Be sure to check out the price and reviews on Amazon.